A Rake is a probe or probe assembly with multiple tips, and allows for multiple measurements to be taken simultaneously. These probes save valuable resources by reducing set up and test times. 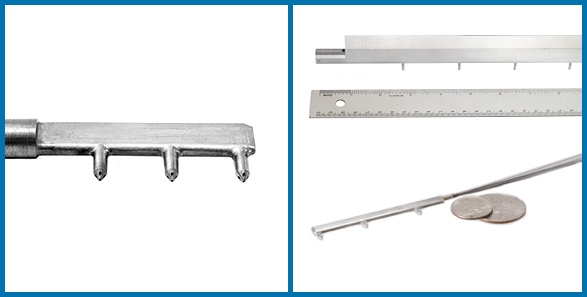 Rake probes are custom designed for each application, are manufactured in an array of sizes, and can incorporate Multi-hole probe tips, Kiel, Total Air Temperature (TAT), or combinations of these. Rake probes are ideal in applications where schedule or cost must be reduced. Because multiple measurements are taken simultaneously, there is no need to run a test, move the instrument, and rerun the test. Rake probes are often used when measuring high swirl inlet flows for turbomachinery and automotive engine compartments. Contact us today for more information about the Rake probe.